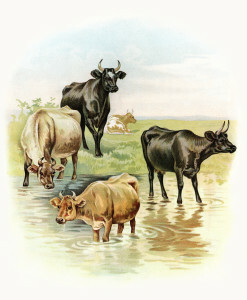 Here is a wonderful vintage image of four cows at the water’s edge in a pasture at the farm. A fifth cow is resting on the grass in the distance. This image is from a children’s book titled Visit to the Farm by Koerner & Hayes, 1896. Click on image to enlarge. Another lovely picture, thank you. I love these animal pictures. Thanks for sharing! Love this image! Thanks SO much for sharing it! All of these were great! Neat image!! Thanks for sharing.